The revival side started in the autumn of 1980, which was about 90 years after the tradition had died out in the village. It was decided to base the style on the Wychwood sides – Leafield, Ascott-Under-Wychwood etc. – as it was thought that contact with these sides was more likely than the likes of Bampton or Stanton-harcourt. Not only was there evidence for this in Sharp’s notes, but there had been times when the sides shared a musician between them. It was felt that emphasis should be placed on giving an impression of height in the dancing, and of athleticism, a decision that has been regretted on many occasions since! People there on the first night were, in no particular order: Dave Townsend, Mark Pollard, Dave Butler, Steve Fraser, Chris Marshall, Dave Parry, Dave Powell. Malcolm Eva, Keith Dandridge, and his son Karl. If I have forgotten anyone, I apologise, it was over twenty years ago. Before long, we were joined by Ron Clements and John Hicks. Practices were held weekly in the back room of the Bell Inn, in what was then a function room. It has now been converted into a bar and looks impossibly small to dance in, particularly for the expansive style that has developed. However, it did mean that we learnt to dance in restricted spaces where necessary. There was a bench seat fixed against the back wall of the room and one practice, during rounds, one of the dancers slipped, and in one continuous movement disappeared from sight under the bench. Very impressive, but he could not be persuaded to repeat the performance. After the practice we would move down to the bar, which is now the restaurant, where there would be an open fire during the winter. On one occasion the fire was getting low, but there was still some time before we would be leaving, so one of the side put another log on the fire. A few minutes later the Landlord’s wife came through, and dragged it back off, whilst admonishing the unfortunate person who had put it on. Neither she nor her husband seemed particularly adept at customer relations, as we eventually fell out completely and changed our practise venue to the village hall, where it has remained since. We drank in the other pub in the village, the Strickland Arms, for a while, but have since reverted to using the Bell, the landlord having long since changed. The first squire was Keith Dandridge, with Mark Pollard, who had danced before as foreman, and Dave Parry playing and dancing. Dave Townsend also played for us a lot of the time until we became established. Our first public appearance was in the driveway of the Bell one evening about a week before our first proper appearance, our first day of dance. This was on the 2nd of June 1981, starting in Ducklington. For the day we decorated our hats with Lilac and Laburnum. There is reference to the maypole being decorated with these flowers. In the absence of any other references to colours, we took these two colours as what we would use for ribbons. Originally we had baldricks made in yellow and purple, but the ribbons were different shades, and it was decided that we would forget about baldricks. Except for Keith, who decided that this tasteless clash was just what the squire needed as a badge of office. He continued to wear them until he retired as squire. No one continued that short-lived tradition. At the same time as we started, a women’s side, Queen Emma’s were formed, and during the first year we danced out together a lot, providing a fair amount of mutual support. Also it was convenient as there were several husband and wife pairings across the two teams. Our first winter ale was held in late November, and, regrettably, a certain amount of old fashioned thinking surfaced during the planning, when it was decided to make it a male sides only event. This led to a statement of intended boycott by one other member and myself, and in the end I did not attend. The following year common sense prevailed and we invited Emma’s. Members came and went as the years went by. The first notable departure was Mark Pollard, who was succeeded as foreman by Andy Cheyne. Keith Dandridge retired as squire, to be replaced by Ron Clements. Keith left about a year after that. John Hicks served as Bagman for some years, as did Steve Fraser, and Neil Sleight. I was squire for a few years, and Pete West is now the squire for the second time in the side’s history. Roger Barnes was also squire for a while, and now does sterling service as a musician. Michelle Soinne was our main musician for a while, when she retired her place was taken by Chris Howe, with Alexander Marshall joining from Queen Emma’s. Our number dropped slowly over the years, until in the Autumn of 2000 it was passed at the AGM after much deliberation, that we would become a mixed side. The alternative seemed to be to fold the side gracefully before it became impossible to carry on. 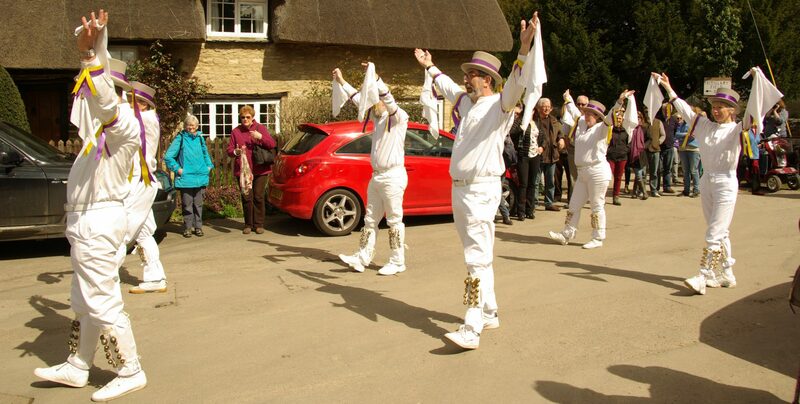 We had witnessed Stony Stratford, one of the great sides who started about the same time as us, perform their last dance in public, at our day of dance a few summers previously. A very sad moment. The same fate seemed to be awaiting us. It is therefore very pleasing to be able to say that the side has been rejuvenated as a consequence, and we have several women in the side. We now also have some new men and the prospects for the future of the side look good. This is a brief history of the revival side based largely on my memory with some additional information from Badger. I apologise for errors and omissions and invite anyone who can supply additional information, whether a former dancer or not, either of a general nature, or specific dates, or names of dancers with dates, or anecdotes or memories of the side to contact the side using the contacts page.